All users subscribing to "my_key" will have a notification created in their stack when notify() is called. If you have emails enabled, subscribers receive a summary of notifications at an interval of their choice. Data can be accessed easily from Django models or from the included JSON views. Starting from django-nyt 1.0, support for the upcoming channels has been added together with Django 1.9 and 1.10 support. Users need a cleverly sifted stream of events that’s highly customizable as well. By using django-nyt, your users can subscribe to global events or specific events pertaining specific objects. Instead of inventing your own notification system, use this and you won’t have to design your own models, and you will have a nice guide that goes through the various steps of implementing notifications for your project. Simple API: call notify() where-ever you want. Individual subscription settings for each type of event, for instance: - Event type A spawns instant email notifications, but Event B only gets emailed weekly. 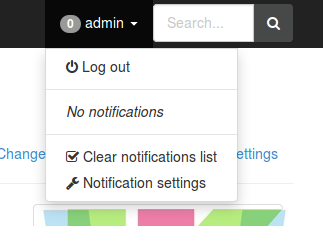 Avoid clutter: Notifications don’t get repeated, instead a counter is incremented. django-nyt does everything it can to meet as many needs as possible and have sane defaults. Provide your users with options to customize their subscriptions and notification preferences. Create your own Form inheriting from django_nyt.forms.SettingsForm. Customize contents of notification emails by overwriting templates in django_nyt/emails/notification_email_message.txt and django_nyt/emails/notification_email_subject.txt. Make the mail notification daemon script run either constantly python manage.py notifymail --daemon or with some interval by invoking python manage.py notifymail --cron as a cronjob. You can also call it from a Celery task or similar with call_command('notifymail', cron=True). In your Git fork, run pip install -r requirements.txt to install the requirements. Please visit #django-wiki on irc.freenode.net as many django-wiki users are also familiar with django-nyt which previously lived inside django-wiki. Use decorators.disable_notify to ensure that all notifications within a function are disabled. © Copyright 2018, Benjamin Bach. Revision 5b5b3b21.